Christina recently did a post about riding bikes in Paris, where helmets aren't typically worn, then returning to San Fran and not really feeling so keen about wearing a helmet. I am a bit in two minds about helmets - it is illegal not to wear one when cycling in Australia, so there is no choice - but a part of me thinks that the choice should be left up to the rider. It has become something that is very automatic for me, so I don't have to even think about it, I just put it on - although it would be nice to be able to wear different hair styles. Being safe is obviously a bigger priority (though I've never fallen off my bike before). Having to wear a helmet - and helmets generally being ugly and totally unstylish seems to be a significant factor in people not riding bikes these days. I have a pretty cute rounded mauve helmet, which doesn't cramp my style too much, but this decoupaged helmet DIY by Modcloth is an awesome way to revamp a sad, boring helmet - I might try it with another helmet. Modcloth have been doing some other sweet cycling style posts lately including cute helmets, pedal savvy fashion, the Modcloth bike ride guide, write a bike and the "We Can't Stop Talking About... Bikes!" post. 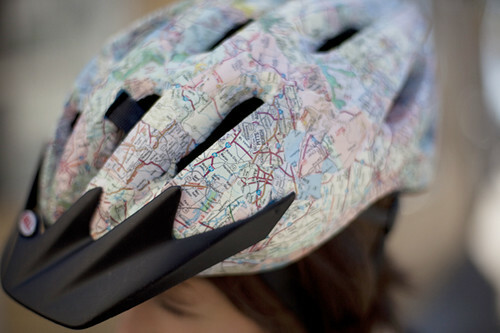 Planet Green also has a guide to Pimping Your Bike Helmet. PS. I'd die for an Audrey Kawasaki bike helmet!